Eileen Kernaghan and Mix Hart will read from their books Sophie, In Shadow and Queen of the Godforsaken. Eileen Kernaghan lives in New Westminster, B.C. Sophie, In Shadow, a story of spies and conspiracies in India under the Rai, was shortlisted for the 2015 Sunburst Award for Canadian Literature of the Fantastic. 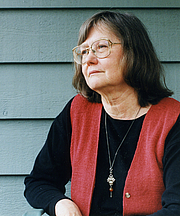 Eileen Kernaghan is currently considered a "single author." If one or more works are by a distinct, homonymous authors, go ahead and split the author. Eileen Kernaghan is composed of 4 names. You can examine and separate out names.